Child seats for bicycles come in all different shapes and sizes depending on the target age of the child riders. They also mount onto the bicycle in a variety of different ways and in different places. Bicycle compatibility depends on the make and model of the child seat and of the bicycle, with some seats being more versatile than others. 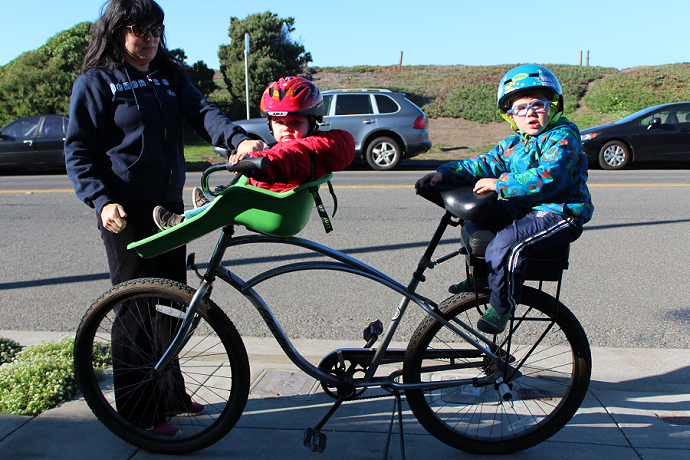 Both a front-mounted and rear-mounted child seat on a cruiser in SF, CA. 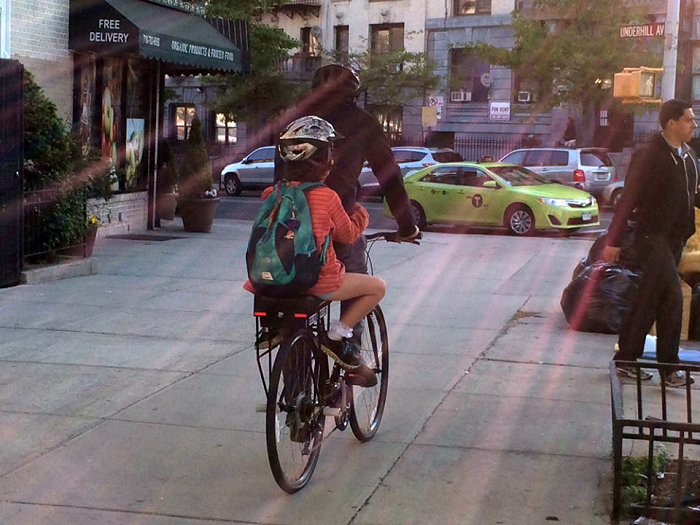 There are three primary places where child bike seats are mounted onto a bicycle. The most common is over the rear wheel, either onto an existing rear rack or with its own mounting hardware. Typically this position on the bicycle will provide the largest versatility in passenger-size, though bicycle compatibility may be a little more challenging than the other placements. Less common but growing in popularity is on the handlebars. This placement limits seats made for babies and toddlers only, based on size and weight constraints. The least common placement is on the top-tube of the bicycle. I have personally only seen DIY bike seats in Thailand that went this route, though I know of at least one start-up business (Mac Ride) that has a great design for this placement on a bike. The most common bike seat for babies and small toddlers is probably best-described as putting a car-seat onto a bicycle. The seat and backrest are one unit, and usually include a seat-belt to strap the child in securely. Rear-mounting seats support around 50 pounds maximum and are usually aimed at children ages one to six. Front-mounting seats support a maximum of around 40 pounds and are for typically designed for children ages one to four. Some models for babies and toddlers install onto existing rear bike cargo racks. Others mount onto the rear seat-tube of the bicycle, and are also compatible with most bicycles, including road bikes, mountain bikes, cruisers, path-and-pavement bikes, and ebikes. Bike child seats that mount on the front handlebars are also largely universally compatible. Bike child seats built for older children and heavier weight limits are almost exclusively limited to cargo bikes and utility bikes, though not entirely. These bike child seats can support much heavier passengers, up to 200 pounds. Cargo bikes have an elongated rear-end, providing additional space for cargo and/or a passenger. Most cargo bikes offer add-on seat cushions, backrests, handlebars, foot rests, and other accessories to make a comfortable ride for an older child. Companion Bike Seat is the only bike child seat with weight limits that can support older children and is an add-on accessory for most any bicycle. It mounts onto foot pegs that are installed onto the rear axle, providing the maximum weight capacity possible on a standard bicycle. It's the perfect bike child seat that your kid can grow into, but never grow out of. Backrests are available for Companion Bike Seat as a separate accessory. Seat-belts and frame guards (to guard feet away from the wheels) are both in the design pipeline for 2016.